What causes war? How can military conflicts best be prevented? 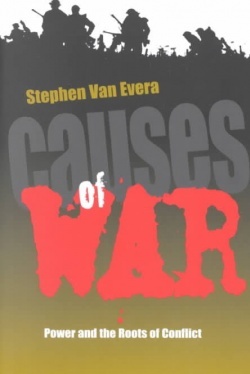 In this book, Stephen Van Evera frames five conditions that increase the risk of interstate war: false optimism about the likely outcome of a war, a first-strike advantage, fluctuation in the relative power of states, circumstances that allow nations to parlay one conquest into another, and circumstances that make conquest easy. According to Van Evera, all but one of these conditions—false optimism—rarely occur today, but policymakers often erroneously believe in their existence. He argues that these misperceptions are responsible for many modern wars, and explores both World Wars, the Korean War, and the 1967 Mideast War as test cases. Finally, he assesses the possibility of nuclear war by applying all five hypotheses to its potential onset. Van Evera's book demonstrates that ideas from the Realist paradigm can offer strong explanations for international conflict and valuable prescriptions for its control. How Much History Can Offense-Defense Theory Explain?